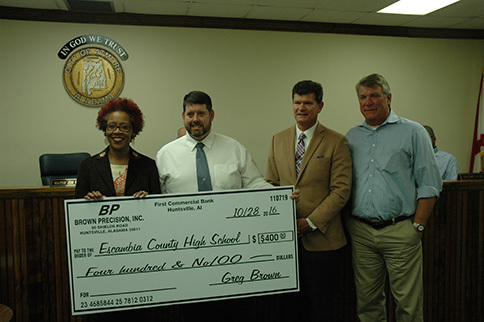 The presentation to ECHS, from left, ECHS teacher Yolanda Walters and Principal Dennis Fuqua, Greg Brown and Dan Brown. Among the business conducted during the Monday, Nov. 28, Atmore City Council meeting were the approval of two agreements related to lighting and traffic signals near Rivercane Industrial Park and the swap of small tracts of land with Poarch Creek Indian officials. But the agenda item that drew the most attention was the formal announcement of the winners of a contest among local schools to name the access road to the multi-million-dollar Brown Precision manufacturing facility presently under construction at Rivercane Industrial Park. “The best part of this meeting is the presentation of the checks to our high schools,” said Mayor Jim Staff before the company’s co-CEOs awarded $400 each to Escambia County High School and Flomaton High School. The road name that was chosen, Innovation Parkway, is actually a combination of the efforts put forth by the two local schools. Greg Brown, Brown Precision’s chief financial officer, and Dan Brown, company president, awarded the giant facsimile checks. * a pact with Alabama Department of Transportation for installation, operation and maintenance of traffic control signals and roadway lighting. * a resolution authorizing Civil Southeast LLC to make application to ALDOT for sidewalk improvements. * a request by Concerned Citizens of Atmore for Christmas in the Park, an evening of holiday festivities to be held Dec. 17 in Heritage Park. * the transfer of a retail off-premises beer license for Fast Lane on Jack Springs Road. * an agreement with ALDOT allowing the city to install, at city expense, four light poles at the industrial access road on Alabama 21, near Jefferson Davis Community College. * warranty deeds related to a land swap under which the city cedes a triangle of land it owns in the Wind Creek Casino parking lot in exchange for a triangle of land owned by Poarch Band of Creek Indians that is located in the parking lot by Heritage Inn. * granting of a utility easement to Poarch Band of Creek Indians through a drainage ditch that abuts Wind River Road South and Wind River Road North.